Ah, December 2011. 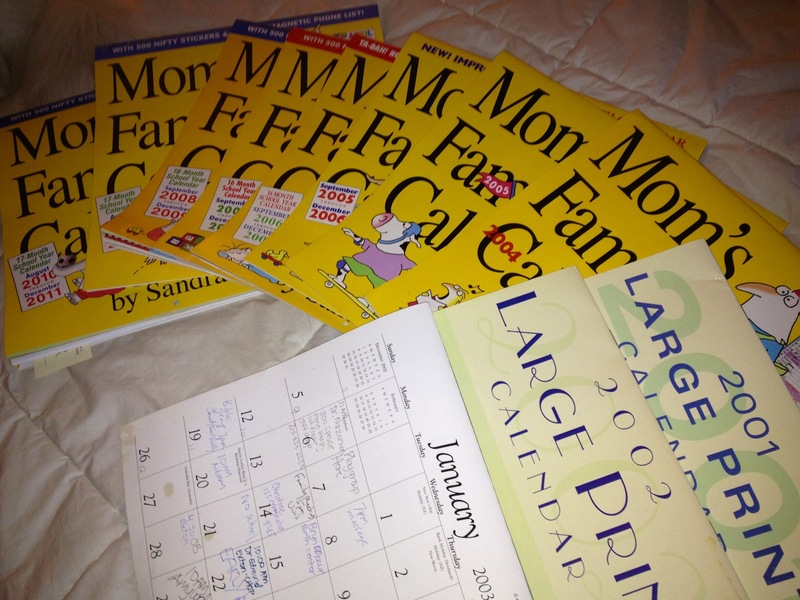 Soon it will be January 2012, and I normally would have purchased my 2012 Mom’s Family Calendar by Sandra Boynton long before today. However, Ed mentioned that maybe we should finally end this annual tradition. He wasn’t trying to be mean or miserly, just practical. After all, between Google calendar and his Blackberry and my iPhone, we manage to get where we need to be well enough. And truth be told, some of us aren’t as vigilant as we once were about meticulously recording every event on the paper calendar hanging on the inside of the basement door. “Check the calendar!” used to be the standard answer to the question, “Are we free on the 16th?” Now, more often than not, it’s a matter of checking the phone or the computer, not the calendar. Poor, neglected old dinosaur. In general, I am the opposite of a hoarder (cocktail napkins, aside). Whatever the word is for a person who throws out too much stuff and then later regrets it — thoughtless purger, perhaps? — that’s me. I get a perverse thrill from throwing stuff out or giving it away. But for some reason, Future Dawn in the Nursing Home spoke with me in 2001, and she said, “Don’t do it. Don’t throw out these calendars. Yes, it seems like clutter now, but one day you will want them to remember your life when you were young and busy and all the pages were full.” I am glad I listened to Future Dawn. Sometimes I look through them and sob and remember when my babies were young and our days were filled with play groups and pediatricians and Kindermusik and Gymboree and French lessons (I was way more ambitious back then) and soccer and so much lacrosse and picnics at the park and apple orchards and pumpkin patches and preschool interviews (!!!) and…all of it. So much has changed. So many people who lived in those pages are now gone, either dead gone or gone from my life. Pets we faithfully took to the veterinarian year after year are now buried in the back yard. More than a few couples we would meet regularly for dinner or even vacations are now divorced. Annual neighborhood golf outings are no longer annual. Babysitters now have their own babies. Time has marched on through these pages, both literally and figuratively, month after month, year after year. Will 2012 be the year I finally give up the calendar? I don’t know if I can do it. Aside from my memories, the calendar seems like the only tangible evidence of this life I lead, and I’ve already forgotten so many of the small details. If I don’t write it down on real paper, can I be sure it even happened? This entry was posted in Life and tagged calendar, memories, parenthood, Rent, Seasons of Love by Mom Mom's Apron. Bookmark the permalink. I thought I was the only person to save all my calendars. Sigh. It it so nostalgic to look back.